Ginza is one of Tokyo’s most promising shopping, dining and entertainment district. It is not an exaggeration to say that it is one of the most expensive and luxurious cities in Japan. In order to start the day right, you must first enjoy a hearty breakfast. The great thing about Ginza is that there are plenty of places where you can go even in the early morning hours. These 10 places in Ginza serve delicious breakfast that is guaranteed to make a great start for your day. American is a cafe that specializes in sandwiches. Their egg sandwich is simply fantastic and one of the most highly recommended item on their menu. If you are not a big fan of egg sandwiches, you might want to try their tuna sandwich. The cafe is not that big and most people go here for take-out orders. In any case, don’t let that stop you from having breakfast or brunch in this popular cafe found on the backstreets of Ginza. MERCER BRUNCH will wow you with their French toasts. This popular Italian Cafe has gained a following when it comes to their breakfast courses. The terrace view only enhances the atmosphere as you enjoy the dining experience. Like most popular cafes in Japan, it is normal to see a long queue outside the cafe. If you don’t want to suffer the long wait, try to get there as early as possible. 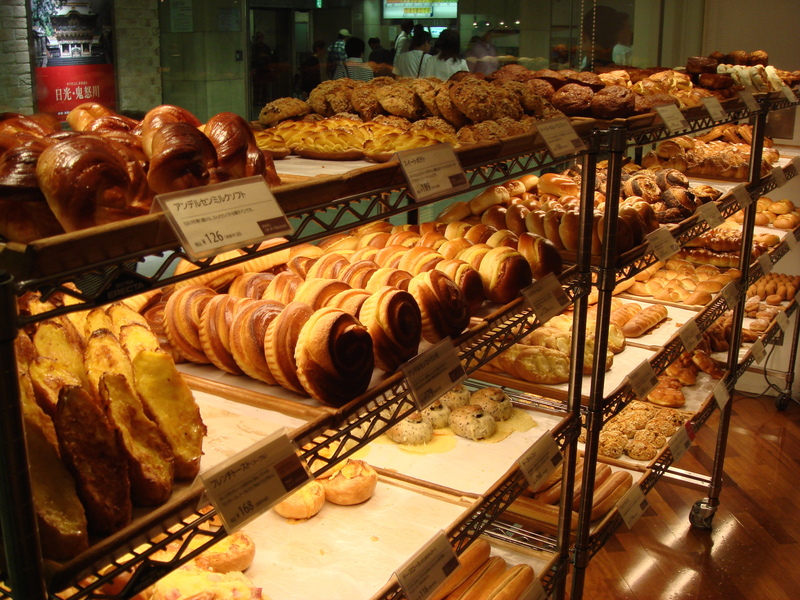 THE CITY BAKERY is your one-stop pastry shop in Ginza. Just looking at their wide array of bread, cookies, muffins, pie, and other baked goods are enough to make your mouth water. If you love bread and love to eat at your leisure, then this is the place to be. With so many items to choose from, it will be a challenge for you and your tummy. Definitely one of the best places to have breakfast in Ginza. Furansuya is a classic coffee shop in Ginza. A very relaxing cafe where you can take your time and enjoy your cup of coffee. The retro atmosphere along with their service strikes a contrast to the countless trendy cafes that you will find in the city. A good place to reminisce about old times. There are smoking and non-smoking seats available. Furutoshi is located on the 2nd floor of the Solaria Nishitetsu Hotel in Ginza. The classy restaurant serves a wide-array of dishes that will satisfy your food cravings. The staffs and their service are impeccable, and one of the reasons why dining here is always a pleasure. Their signature menu you should definitely try is their unique style fruit sandwich. You can have plenty of fruits with freshly whipped cream! Rose Bakery is located on the top floor of the Dover Street Market Ginza. This is a vegan-friendly cafe where you can enjoy healthy and delicious food. The ladies love this place and you can easily tell from their menu. The staffs speak English, so communication is not a problem. You can order your favorite scone, juice, tea, salads, baked goods and their highly recommended vegetable plate. Not a bad choice for picky eaters in Ginza. Note that they offer breakfasts only on weekends and National Holidays. Kimuraya is a well-established shop in Ginza that is famous for their “Sakadane Anpan” (bread rolls filled with sweet bean paste). Who would have thought that a simple bread recipe will become a brand name that will become popular all over the country? The fluffy bread accompanied by the light and not too sweet bean pastes creates a good combination. Have a taste of traditional Japanese bread that can only be bought here at Kimuraya. NOA CAFE is located on the basement floor of the Tokyo New Ginza Building. One look and you can tell that they have a lot of “waffle” to offer. The staffs and the service are great, and the waffles are just as good. Take your pick among the many flavors and indulge yourself, while sipping a cup of coffee in NOA CAFE. Restaurant Sky is found high up on the 16th floor of the Mitsui Garden Hotel Ginza Premier. Great selection of Japanese and Western dishes. The scenic views of the city are something to look forward to. Great service and worth dropping by. A great alternative if you want to enjoy some classy breakfast in Ginza. Yoshisoba is a standing soba bar where you can enjoy delicious food at a very affordable price. A very popular place in Ginza and the locals highly patronize it. The soba and tempura combo is the highly recommended choice for those who have no idea on what to order. They are open 24/7 so drop by anytime you want and enjoy their delicious treats.